By buying this product you can collect up to 10 loyalty points. Your cart will total 10 loyalty points that can be converted into a voucher of $2.50. 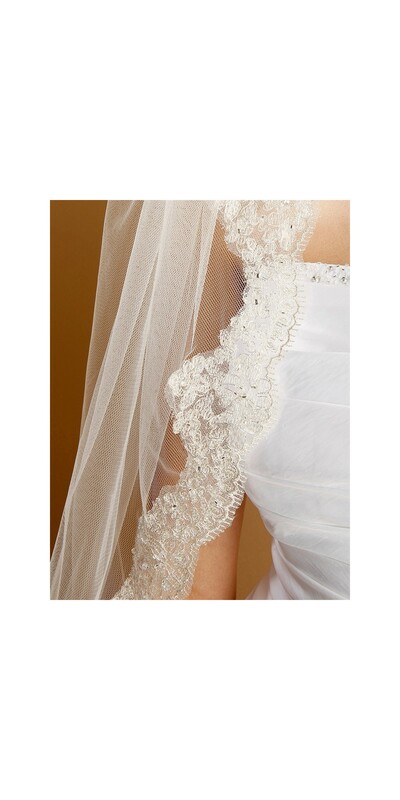 This gorgeous and luxurious Victorian Mantilla Wedding Veil features a richly embroidered scalloped eyelash lace edge beautifully crafted. Our one-layer Victorian inspired Mantilla is threaded with delicate silver chain and gorgeous embellished with sequins, pearls and clear beads. We offer this exquisite 1920s Fingertip length (36") Mantilla in White/Silver or Ivory/Silver and includes an attached metal comb. This wonderful vintage inspired Mantilla veil is a classic top seller and will definitely be a customer favorite for any retailer or stockist!